Over the last few years, I have made a valiant attempt to integrate guided inquiry, project-based learning and relevant technological tools into my courses in an effort to create student-centered classrooms full of highly engaged student leaders. It was clear to me after reading about constructivist theory in graduate school this week that I am a big believer in its principles, as my students have (more or less!) really enjoyed creating their own concepts and ideas via artifacts, projects and presentations that represent their research and hypotheses (Laureate Education, Inc., 2010). In their book, Using Technology with Classroom Instruction that Works, Pitler, Hubbell and Kuhn (2012) discuss several technological tools that help to engage students, as well as enable them to fully participate in an inquiry and project-based learning environment. Some of these tools and their relationship to constructivism are elaborated upon below. Graphic organizers can serve as a scaffold into higher levels of thinking and synthesis (Pitler et al., 2012). I am a big fan of Google Drive because it adds the bonus feature of actually sharing these ideas with classmates and instructors in a virtual environment that can be accessed anywhere at any time. This is ideal for a project-based learning classroom, which relies on collaboration as one of its key components (Orey, 2001). Google Docs can be used to take, manage/organize and share notes (including embedded tables), Google Sheets can be used to record, organize and store data, and Google Sheets can be used to organize a lump of information into easy-to-follow slides in a particular order and/or separated into specific sections. Additionally, Google Drawing allows for students to create concept maps for the purpose of brainstorming. Google Sites also provides a means for students to organize large amounts of potentially dissimilar information types (files, videos, links, notes, etc.). Students can use a Site either individually or collaboratively as a Wiki. They may also use the Comments feature to leave each other rich feedback, another aspect of constructionism in the classroom according to Orey (2001). Blogger, which is powered by Google, can provide students with a means of using language to store and analyze data in a way that helps them to identify patterns, make informed predictions and/or revise their work (Pitler et al., 2012). It also allows for more collaboration in the form of comments and feedback, and integrates constructionist elements such as dialogue and interpretation, discussion of learning, revision and reflection (Orey, 2001). Pitler et al. (2012) mention interactive spreadsheets as being useful; this is also true of Google Forms (found in Google Drive), which can take the form of surveys that instantly collect data and/or feedback and display it in the form of pie charts, bar graphs, percentages and other formats. The data can also be manipulated on an associated spreadsheet as suggested by Pitler et al. 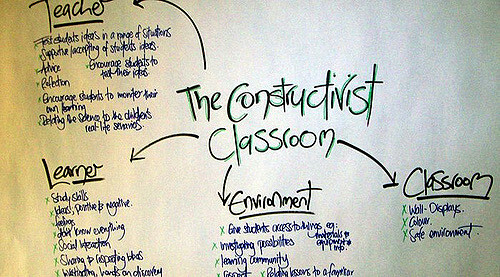 (2012) by individuals or small groups in the classroom. Google Groups and Google Hangouts also give students an opportunity to discuss their ideas and/or data collaboratively for the purpose of analysis and revision. Groups and/or Hangouts could even include authentic real-world audiences such as (in our case) German partner schools or native German speakers, thus fulfilling another of Orey's (2001) constructionist classroom elements. Pitler et al. (2012) state that "simulations and games allow students to apply their background knowledge to make predictions, receive immediate feedback, and see the outcomes of their hypotheses." There are several technological tools that make this possible for students. Google Voice is a tool that students can use for a variety of purposes, including the simulation of audio clips and/or conversations related to a research topic. For example, students researching parties among German teens might have their peers call Google Voice and leave an RSVP message saying whether or not they are planning to attend an upcoming event. VoiceThread is a similar tool capable of recording audio samples with visuals, thus making it possible for a group of students working on German politics to create a simulated ad targeted at German voters. These kinds of activities can provide a high level of engagement, something that Orey (2001) and Pitler et al. (2012) agree is essential in a constructionist environment. Additionally, it requires students to actually create something, thus contributing to the process of creating their own ideas and concepts while making calls or sample ads (Laureate Education, Inc., 2010). Technology seems to have a very natural link with constructionist theories. As Lynda Donovon, a teacher in Northfield, NJ states, "Technology is the future" (Laureate Education, Inc., 2010). Like Lynda, I am quite excited about preparing my students for a world in which they can build their own concepts and use technology to do it! Laureate Education, Inc., (2010). Constructivist learning theories. [Video webcast]. Retrieved from https://class.waldenu.edu/webapps/portal/frameset.jsp?tab_tab_group_id=_2_1&url=%2Fwebapps%2Fblackboard%2Fexecute%2Flauncher%3Ftype%3DCourse%26id%3D_3469248_1%26url%3D. Orey, M. (Ed.). (2001). Emerging perspectives on learning, teaching, and technology. Retrieved from http://epltt.coe.uga.edu/index.php?title=Main_Page. Have you actually used any of these software programs with your students? I'm excited to try some of them out, but wonder which ones people have used and how effective they actually were. Hi Erika! Yes, I have used all of them! Everything I've written about in the blog entry comes from personal experience. If you pick out one or two you want to start with, I'd be happy to comment on those! Just let me know how I can help. I love reading about the lessons and activities that abound in your classroom, and must admit, I am rather envious of your technology skills and knowledge. At times it feels like all I can do to manage being prepared to teach, manage my own classwork and keep things going at home. Any secrets for integrating the technology, as in do you test the products and theories on breaks, or in the evenings? I do not use all of the Google resources that you mentioned, but would like to start adding them in to lessons. With limited technology for the students to use, it is often hard to make plans. All of these Google resources are available on the iPad, correct? Hi Julie! I totally understand feeling like the tasks of prepping, teaching and classwork are enough to keep you busy on their own. Really, it's a tough job and ridiculously time-consuming in and of itself, without all the technology added. For me, the tech integration has come somewhat naturally because I use all this stuff in my personal life. I have always been really into computers, and, in 2007, a good friend who is also a technophile suggested that I switch from Hotmail to Gmail and start using Google products. At the time, it didn't even occur to me to use them at school (nor did the districts I was teaching in back then even have such capabilities), but I fell in love with Google quite quickly and therefore had sort of an edge in 2008 when I landed at Hunterdon Central and was able to bring it all into the classroom. So, no, I don't really test out the products because in the vast majority of cases, I already know how they work. Also, I am really best as a last-minute planner, so when I am using something new (like when I tried VoiceThread last semester), I just do the model the night before and then integrate it the next day. It usually goes at least 85% well, and then I just note whatever I want to adjust next time. I think the moral of the story is that tech works best (and you learn tech best) when you are not afraid to click everywhere, try whatever and be flexible if it fails. I am never, ever embarrassed when something blows up in front of me during a lesson; I just look at the kids, laugh and make a joke and even sometimes take suggestions from them on how to troubleshoot. It always works out somehow! The people with this same attitude are the colleagues of mine who tend to be making the fastest, broadest strides in the tech integration field. Dunno if that helps, but I hope it does! All the Google resources I mentioned are, in fact, available to anyone for free... however the iPad is one of the only devices that only allows limited compatibility (students will not be able to work with Google Doc tables, Sheets, make edits to Slideshows, etc.). This is because Google and Apple are competitors. They'd honestly be better off on a smartphone even, or really any other device possible. (Thus, I am not a big fan of iPads). I forget--is your school 1:1 with iPads or BYOD or something else entirely? Glad to help and please reach out any time you need anything! Google is a wonderful tool that students can use in Constructivism. It allows them to create so many projects and external artifacts. There are just so many services that Google provides. I have been taking some training on Google and its features. I was not even aware of all the things that you could use it for. I have taught my students about Google sites in the past, but that was about it. Now I am teaching at a Google school, meaning they use Google for everything, I am using it more as well. I love Google! I am training to become a Google Certified Trainer because I want to share this stuff on a broader level with educators. I think the Apps are absolutely wonderful. So exciting to hear you are also at a Google school! I look forward to talking to you more about Google throughout this course!